We look forward to meeting you on the W. J. Colen Freshmen Retreat! 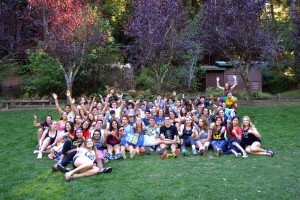 The Freshmen Retreat is a long-time favorite of Jewish Cal Students. Hillel takes a group of 50+ students to a beautiful retreat center nearby to get a break from the craziness of school, to meet new friends, and enjoy the amazing nature the Bay Area has to offer. This year our freshmen retreat will be on September 15-16 in the Marin Headlands complete with beautiful ocean views, a great beach, and plenty of hiking! Retreat is one of the most popular and memorable Jewish experiences for many students on campus – don’t miss out on your chance to join us! Which Gender Roommates Do You Prefer? Any other food allergies or dietary restrictions? Do you have any medical or other needs that we should know about to ensure a safe and comfortable experience? Do you know anyone else who might be interested in coming on the retreat? If so, please write their full name below with their email. Why did you decide to come on the retreat? How did you hear about the retreat? Please check all that apply!